Appendix is a familiar term for our society. Most people consider that the appendix is a disease that must be treated immediately. Though not so lho, Then what is the appendix? Appendix or in Latin called appendix vermiformis is an organ shaped like a gut but smaller and ends buntuk. These include immunologic organs that actively play a role in the process of secretion of immunoglobulin. The secretion of immunoglobulin itself is an immune system in which there is a lymphoid gland. In addition to humans, appendicitis is also found in animals, such as mammals, birds, and reptiles. Although at first appendix is considered as an organ that does not have any function for the body, but along with the development of medical technology the function of appendix began to be known by many people. If appendix vermiformis is an organ that has its functions and duties in the body, then appendicitis is a condition when there is inflammation of the appendix or also called appendicitis. Appendicitis or appendicitis if left then it will be prone to rupture and infection can spread. That's why a medical operation should be done to remove the inflamed appendix before it breaks and complicates it. Before knowing what are the symptoms of appendicitis, we need to know what causes a person stricken with this disease. In general, the appendix is caused by a blockage. Obstruction will make the contents of the appendix can not be channeled as a result of accumulate, increased pressure, excessive bacterial growth, and then arise inflammation. Blockage is often caused by a hard stool (fecalith). In addition to stools, blockage can also be caused by grains, gall stones, and intestinal worms Oxyuris vermicularis. In addition, appendicitis can also be caused by the infection of Salmonella and Shigella bacteria and blockage occurs by other objects. This is a symptom that often occurs in people with appendicitis. 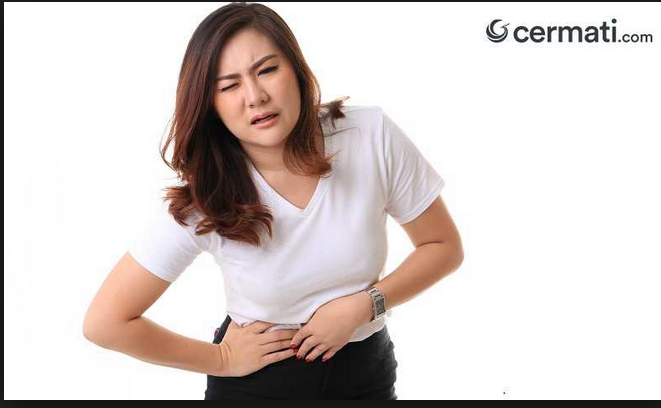 Unfortunately, this stomachache is not just a symptom of appendicitis but there are many possible types of illness characterized by abdominal pain, such as urinary tract infections (UTI), pelvic inflammation (infection of female reproductive organs), bowel irritation, and some other diseases . However, there are a number of signs of appendicitis, among which is that abdominal pain starts from the middle abdomen or around the navel. The pain will arise and disappear erratically. Then the pain within hours will move toward the lower right abdomen and stop at a point called the McBurney point, the place where the appendix is located. The main symptom of appendicitis is lower right abdominal pain on McBurney's titi. At this point mcBurney stomach pain will feel constant and if touched the pain will be more felt. The pain will get worse if the patient has coughing, walking, taking a long breath, and other activities that create pressure on the stomach. Another symptom of the appendix is the stomach will feel nauseated. Although not all nausea is a symptom of appendicitis, but if the nausea occurs greatly, even causing a strong vomiting, then it needs to be wary. Meriyang is also not the only sign of appendicitis, but there are many diseases marked by meriyang this. But if the meriyang is accompanied by signs of other appendicitis, then it should be immediately consulted to the doctor. In addition to meriyang or fever, usually the face of appendicitis will be flushed. This is due to the effects of the pain he suffered. Between diarrhea and constipation are two different things. But both are one of the symptoms of appendicitis in a person. This is due to not smooth the digestive system in the body. This condition is not much different. Decreased appetite is caused by the inability of the digestive system in the body. What is meant by rebound tenderness is the pain in the lower right abdomen is so great. The above are symptoms of appendicitis in general or commonly occurs in adults. However, according to the Journal of the American Medical Association states that these symptoms do not always appear in all appendicitis patients, especially in children. This is a symptom that usually occurs in all appendicitis patients. Abdominal pain is one of the most common complaints in pregnant women. But if the pain occurs in the lower right abdomen and occurs in a long time, then it needs to be wary. In addition to the lower right abdomen, pregnant women who are attacked by appendicitis can also experience pain in the upper abdomen. This happens due to changes in position or location of the appendix during pregnancy. Nausea, fever, and lack of appetite as described above may not always be an indication of appendicitis in the body but if the signs are followed by other signs, then it should be consulted immediately. In addition to appearing in adults, fever will also occur in children affected by appendicitis. Although fever is not always a sign of appendicitis, but if the sign is followed by other appendicitis traits then it should be wary. Pain loose is a pain that comes and disappears suddenly within a certain time. This is the main symptom of the appendix. Patients with appendicitis will experience pain starting from the navel then spread to the lower right abdomen or at the point mcBurney. Children with appendicitis will experience an increase in the number of white blood cells. This happens as a result of an infection that occurs from within the body. So was the discussion about the symptoms of appendicitis. May be useful.